David Mitchell and Robert Webb from Peep Show fame are brilliant and dare I say, bordering on insanity. These men are easily the funniest people I have seen on TV. 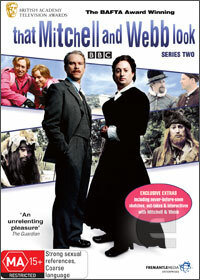 Although more commonly known for the cult TV comedy Peep Show, they also indulged in some more mainstream humour with "That Mitchell and Webb Look". Thankfully series 2 is finally on DVD and these two UK comic geniuses do it again as they perform a variety of hilarious skits such as Sir Digby, a drunk who is always fighting with his nemesis and my favourite, the game show parody, Numberwang! And yes, once you have heard the word Numberwang, it will never EVER get out of your head. Although series one was a little bit of a hit and miss, series two is definitely more refined and although it's not as quirky and outrageous as Peep Show, it's still a very entertaining series that had us all in hysterics. Thankfully the pair created some new characters for series 2 such as Helipets, two airborne veterans and a poor lad with the face of an arse. There's even some great cameos that you would appreciate more if you're British but overall, these two guys are on a role. It's a shame that not all the characters from the previous series return but at the end of the day, Mitchell and Webb continue to push the boundaries of comic genius. From scarecrows to homeless nutters and veterans, That Mitchell and Webb Look Series 2 also features some fun special features from new sketches, outtakes and a great interview with the both Mitchell and Webb. Check it out if you're a fan of either Peep Show or love unrestrained British Comedy!